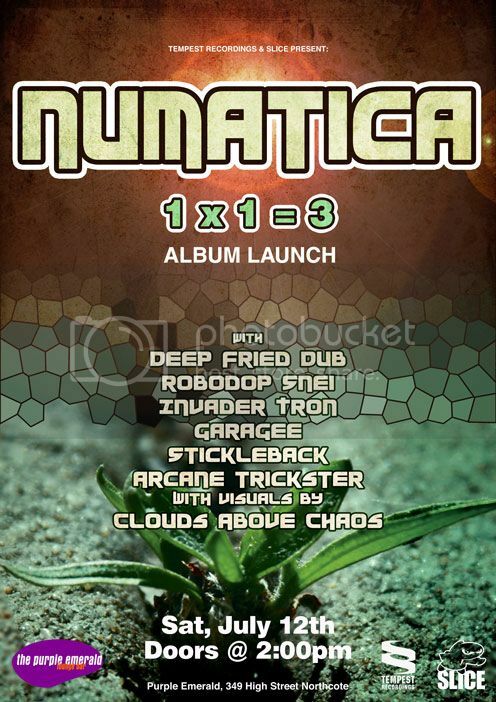 Tempest Recordings and Slice Records & Events present the launch of Numatica's new album "1 X1 =3" in a special matinee show with supports from Deep Fried Dub, Invader Tron, Robodop Snei, Garagee, Stickleback & Arcane Trickster with visuals from CLOUDS ABOVE CHAOS. Come along nice and early, it all starts at 2pm, at The Purple Emerald, 349 High Street Northcote, July 12th. The album is availabe from all the best online retailers, including our personal favourite, Bandcamp, as well as iTunes, Beatport, Amazon, Spotify, and pretty much everywhere else. Also, one of the supports for the launch, Tempest mainstay Garagee, has just completed a new video for his track, "To The Dark", as featured on "A Tempest Sampler".